THE QUILTED PINEAPPLE: Finally Some Show and Tell!! Finally Some Show and Tell!! Wow, sorry for my lapse in posts. It has been a busy couple of weeks recently. I missed my deadline for my Le Petite project, which was yesterday. :-( It's the first time I didn't get it done in time. It's almost done and I'll post a pic as soon as I finish it. I have been very busy with client quilts, but haven't been able to share yet. Yesterday I delivered three quilts, so I finally will be able to share some of the fruits of my labor!! I had a tough time deciding which quilt to share first, but after very recent news events, I felt it was appropriate to share this one particular quilt first. One thing I really love about quilting is that every quilt has a story. Why it's made, who it's for,..etc. These stories are what make quilting for others so special to me. I feel like in some small way, I become part of the history of the quilt. I am still so very humbled that someone trusts me to help with their priceless treasure. I really put my heart and soul into every quilt I quilt, as if it's my own. That's what makes them so hard to give back!! 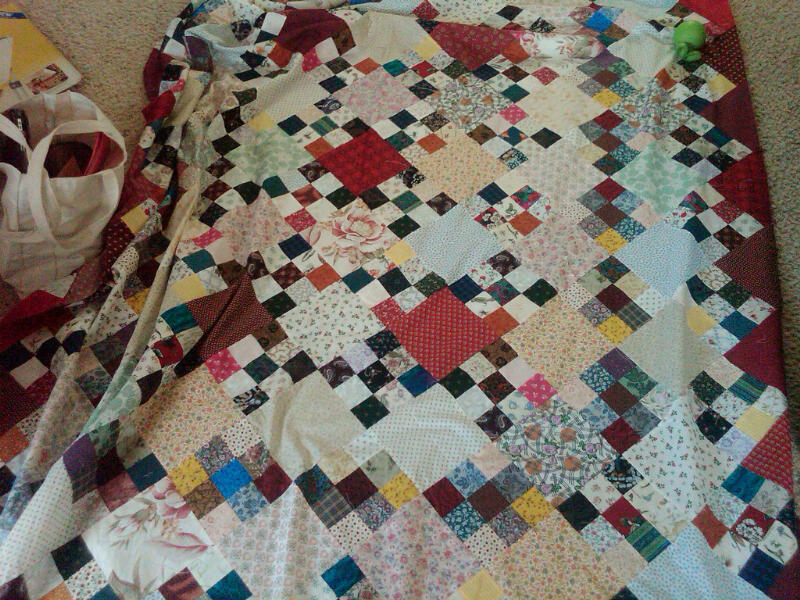 :-) This quilt was pieced by my client, Mary. She did such a beautiful job! It's a gift to her son, who will be deployed to Iraq very shortly. His first deployment. You know how I love a scrappy quilt. AND I love this one!! After meeting with Mary, she told me about her son and we agreed that doing something with stars would be appropriate. In each of the 5 red squares in the center of the quilt, I quilted stars. I used a double layer of batting to make the stars really stand out and give it a trapunto look. I used my new Lapel Stick to stick the extra square of batting in the right place. Worked like a charm! I love the star detail!! I felt this allover design really complemented the top and was perfect for a man's quilt. I love how the back turned out!! Full of texture and the stars really stand out!! I didn't take very good photos of the quilt before quilting, but I had a couple that I took with my phone for some reason. I have no idea why?? Mary was extremely pleased with how her son's quilt turned out. She told me that he will be home for a few weeks before his deployment and she will give him the quilt to sleep with while he is home. She told me she will keep the quilt and tell him it'll be waiting for him when he comes back home. I wanted to start sobbing. Still do as I write this. 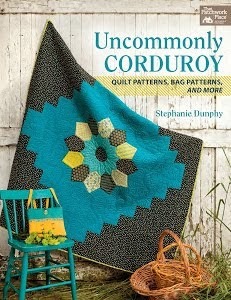 Every quilt has a story and I am so honored to had a very small part in this one. Thank you to all our men and women in Service. Wow, that is some story, I hate that anyone has to go away and fight I wish we could all just live in peace. As usual your quilting is beautiful. Lovely quilt with a very touching story. I truly believe that every quilt tells a story. Gosh, Linda - you've brought tears to my eyes! This truly is a special, beautiful quilt. Your quilting turned it into a work of art! You do the most amazing quilting!! Love the stars on that quilt and the story to go w/it. I've gotten back into quilting recently and I'm enjoying viewing all of yours. Just recently found you and I've already added you to my list of favorites. I hope you come over for a visit sometime. What wonderful quilting patterns for his quilt. I would like to do some americana ones, think it is a great idea for our service men and woman. Oh my.... *reaching for tissue* ...what a lovely story, thanks for sharing! The quilting is beautiful and the stars are PERFECT!!! Thanks for sharing the story! Great job on the quilting. Oh it's gorgeous! Both the piecing and your quilting. This will be such a wonderful quilt for this brave young man going off to defend our freedom. A real treasure. A good scrappy quilt for a dedicated and brave young man. What a great story and quilt. It turned out fabulous! A beautiful story and a beautiful quilt and your quilting is perfect for this quilt , especially love the star detail , that looks amazing and so fitting for the person who is recieving this lovely quilt .Wonderful job in both the making of the quilt and for sure your quilting! That looks great! The starts are a perfect addition! What a story - I'm getting a little choked up just reading it! Thanks for sharing. The quilt looks wonderful - what you did really does it justice. Tell me - how did you get the squares of batting in the right place? I always float my top so I'm thinking you just stuck it under the quilt top in the right place when you got to that point - and if you don't float your top, how in the heck did you do it - LOL?! Gorgeous quilt made with love for a son & quilted to honour that love! that is so touching. you did a great job on the quilt and the stars are so perfect for her son. What a beautiful story...and a wonderful quilt! You did an amazing job! Beautiful quilt and beautiful quilting. I too put my heart and soul into the quilts I quilt, so I could really understand what you meant. 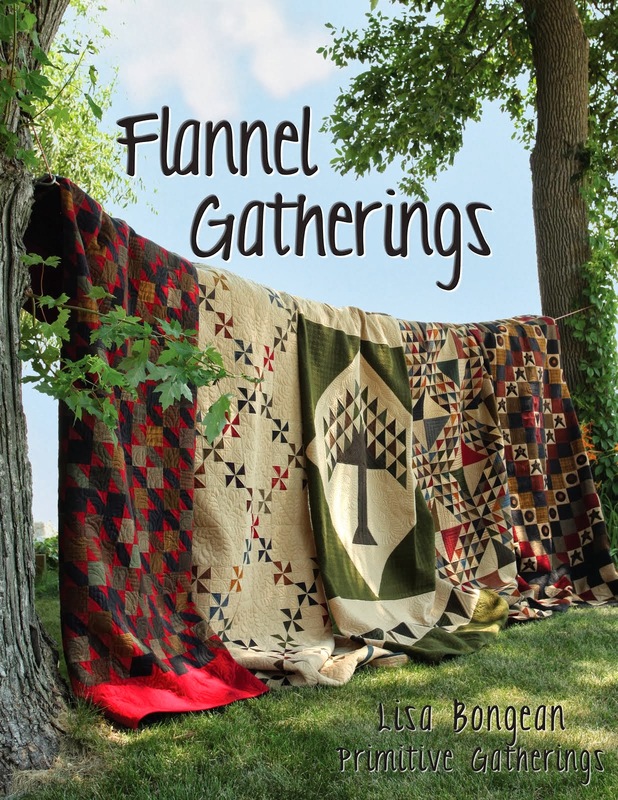 Some quilts are extra specail with the story behind them. What a wonderful story and a wonderful quilt! You had me teary eyed at the end. That quilt definitely has a wonderful story and I hope it has a happy ending with Mary giving the quilt to her son when he comes home. But until he comes home I am sure it will be very comforting for her to have around. Your quilting designs really suited the quilt perfectly! Wow. It is a great quilt top. I like the design. And I agree with Scott....GDG. You are truly gifted! Way to go. A great story behind this one! Linda, As usual your quilting is amazing! What a beautiful quilt top with such a wonderful story! Oh boy - I'll be praying for Mary's son, that the Lord will keep him safe. That quilt is just so beautiful, you did a wonderful job Linda. The stars are the perfect touch. God bless our troops! A very special gift for Mary's son. I do love the star detail. I have a very personal connection with the military--lots of retired military men in my family but most recently my son is about ready to graduate from Army Basic Training. May they all be safe. What a beautiful quilt - how well you have done it, and what a touching story! He will be wrapped in love always. I knew you must have been busy - and the way you have quilted it is perfect!! When a quilt is from the heart - ..two actually - Yours and Mary's - its perfect!! Beautiful quilt and touching story. You did a fantastic job quilting it. May this young man return home to be wrapped in its love. I love our service men and women and their families! What a tear jerker. Thank you to everyone that has viewed my quilt and left such heartfelt and kind comments. Your thoughts and prayers for my son mean a lot to my family. Linda did a wonderful job quilting and I fought back tears when I saw the completed project. My son will be home soon for a brief visit and he has no idea that this quilt filled with love will be waiting for him. This is my first visit to your site and that story brought tears to my eyes. My nephew just got back from Afghanistan and lucky for us, he is fine, except for not being able to sleep. My neighbor just left on her deployment and had to leave her kids with Grandparents...that quilt will hold your friends son when he comes home!